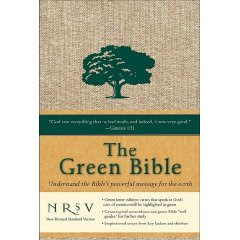 The definitive green movement Bible that shows God is green and explains how we can care for and protect God’s creation. The Green Bible will equip and encourage people to see God’s vision for creation and help them engage in the work of healing and sustaining it. With over 1,000 references to the earth in the Bible, compared to 490 references to heaven and 530 references to love, the Bible carries a powerful message for the earth. This Green-Letter edition of the Bible will highlight scriptures in green ink that teach about God’s care for creation and how God interacts with creation, in an effort to bring greater awareness to how this message is woven throughout the Old and New Testaments. Essays from leading conservationists and theologians on how to read the Bible through a “green lens” as well as a green topical index and Green Bible trail guide for personal study will be paired with teachings throughout the ages to show people how caring for God’s creation is not only a calling, but a lifestyle. I am not sure what to think about this new Green Bible to be honest. First off, I am wondering if it will come in a Catholic edition, with all the Deuterocanonical versions. It doesn't seem to indicate either way. Secondly, it looks like it will include some pretty interesting features that will satisfy the soul of any environmentally-minded Christian. I find the whole green-letter edition thing pretty interesting, although I am not a huge fan of red-letter editions for the words of Christ. In my mind, when you do something like this, it perhaps unintentionally takes away from the rest of Scripture. And we are to read Scripture in light of and in the context of the entire Biblical text. The quotes from various Christian writers on the environment may be one of the Bible's best features. I will be interested to read the thoughts of Augustine and others. Hopefully, the editors of this Bible will let the ancient/modern writers speak for themselves, without any interpretation. Also, I guess it is not a bad thing that the Bible itself will be made of recycled paper. One hopes that it will be durable!